The Guild of masters Gardeners of St. Antoni’s gate was established in this chapel in 1398, devoting it to their patron saints Abdon and Sennen, popularly called St. Nin and St. Non. It’s one of the oldest guilds in Barcelona, uniting the great majority of owners of fields and vegetable gardens of the occidental part of the city. Even in charge of the Guard outside the city in the name of the King. Neither remains nor documentation have arrived to the present day regarding the previous altarpieces. On the other hand there is a magnificent reliquary of St. Abdon and Sennen conserved, which was a gift of the famous Pi’s rector Felip de Malla to the guild in 1410. This reliquary was shown every year during the Fiesta of the patron saints (30th of July). In addition there are known two carved heads of the saints made in 1610, which were put on the altar during special religious celebrations. The present altarpiece was made by Joan Martorell i Montells (1833-1906), who carried out his works in accordance with the Neo-Gothic movement, especially fashionable at that time due to the influence of Viollet-le-Duc. Martorell was one of the teachers of Antoni Gaudí, whom he employed on various occasions as draughtsman and whom he recommended as the builder of the Sagrada Familia in 1883. The brave and fashionable altarpiece designed by Martorell was made in 1885 thanks to a private benefactor, who demanded in return to place the Virgin of Mercy in the middle of the altarpiece, moving the old patron saints to the laterals. In addition were also placed the second patron saint Isidore the Laborer, St. Lawrence, St. Mary of Cervelló, St. Agnes, St. Anthony of Padua and, on the top, St. Michael. Many of the most interesting details like the decoration based in mixing leafs and the side doors with mixtilineal arches, typical of the French Neo-Gothic, were usually used by his pupil Antoni Gaudí. 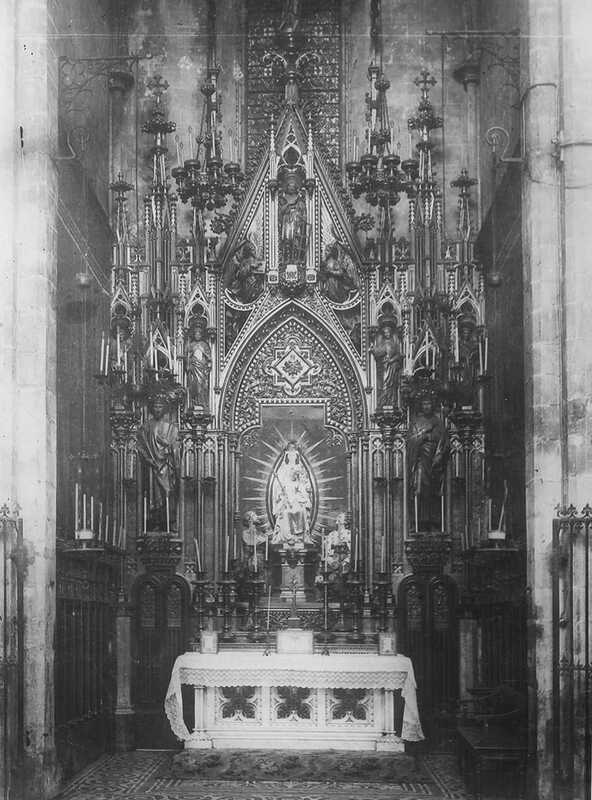 Altarpiece of the Virgin of Mercy before 1936.